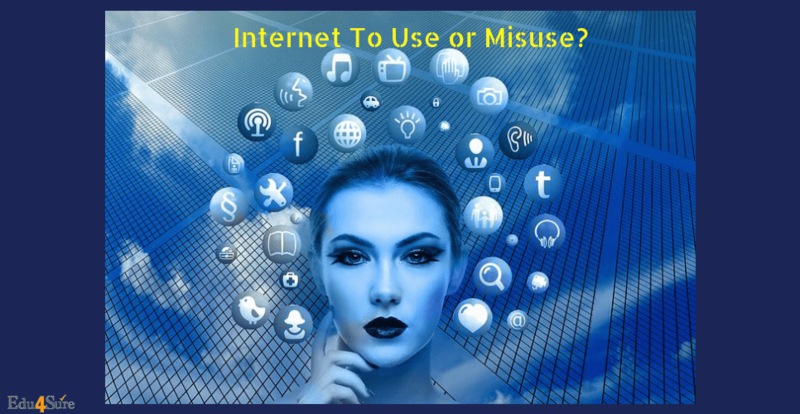 Home Learning E-Learning Internet To Use or Misuse? Our life is confined to the screen nowadays, isn’t it? The rush of life seems more reckless with new technology and the time to rejuvenate the soul is just not available. As we all know, everything has its pros and cons, so does modern life. It gave us smartphones and internet but didn’t teach the right use of it. Actually, technology is neutral, we people are the deciders whether we would use it or misuse it. It’s totally up to you that you want this as a boon or as a curse. There are many advantages of mobile and internet. First of all, today with the help of Mobile and internet one can get many advantages. E-learning concept is not new to us, with the help of smartphone and internet one can learn many useful things. There are bunches of apps and websites that provide you with free courses on whichever topic you want and there are paid courses for professional learning as well. With the internet, you can now communicate with anyone with whom you want to learn something easily as you have to only find his/her social media account. Internet plays a very important role in our life regarding learning internet marketing, programming, different languages, etc. We don’t need to spend hard-earned money on private classes, one can get to learn the same things on the internet using a smartphone. Not only just learning, but you can also even ask your doubt or queries to the creator of that particular subject or topic and they will surely respond to you. The best feature of learning this way is if you don’t understand the particular concept then you can re-watch it the number of times you want. Some platforms also provide a certificate for completing their course which will surely help you in the future. There are a lot of scammers online who can scam you by taking money so going through a trusted website is always a better option for online learning. You spend a lot of time on screen, so that can affect your eyes. For some students, the complicated skills can be a bit hard to understand through e-learning as there’s no face to face communication. 1) Khan Academy – It is the biggest platform in the world which provides free education right from kindergarten to Ph.D., related to any field. Either you can download an application or you can log in through the website. 2) Coursera – You can learn any course and get certified from one of the world’s biggest educational platform ‘Coursera.com’. 3) Udemy – Again there is ‘Udemy.com’, where you have paid as well as free courses that will teach you anything you can imagine. 4) Duolingo – If you want to learn new languages then refer to ‘Duolingo.com’, it is a special language teaching website. There are different websites for learning on different specific topics. There are lots of learning platform available once you search it through the internet, you will get to know about it and you will never regret. 1) Quora – Quora helps you to read all sort of answers that are given by experts or you can even ask questions to an expert directly and they will give you the right answer. 2) Hacker Rank – This platform is built specially for learners who want to learn computer programming. 3) Stack Overflow – This is another platform for learning computer programming. Here you can connect with experts in the programming field. 4) YouTube – YouTube is another great social media platform to learn various things. It’s not like you always have to learn from the internet. Sometimes you can use it for entertainment too. Nowadays ‘YouTube’ has become a great source for entertainment, education, and learning. It could be used to solve your math problems or you can learn to play guitar, you can understand a concept of physics or you can learn magic tricks; everything you can imagine, you can find on YouTube. One can earn money from the right use of the internet. One can start a small business on the internet or one can do internet marketing for companies. Internet marketing is basically promoting something on the internet and you earn commission on it. It’s a good way to start earning at an early age as it requires very less time to do and its beginner friendly that anyone can adapt. Having just bookish knowledge is not enough in today’s world. By using the internet, you can explore a lot of things freely and help oneself to build his or her analytical thinking, logically thinking, general knowledge and more. But sadly, today, teenagers are more involved in social media and wasting time in the apps like ‘Facebook’, ‘Instagram’, ‘Snapchat’ and others. They are wasting their time on social media giving a bunch of likes and comments which is not going to help at all. Excessive use of the internet can also lead to depression and loneliness; as you will go through social media seeing your friends enjoying their life, you will start comparing your life with their, which is bad for your mental health. You will think your life is not as good as their but that is not right. What you see in your friends’ feeds are way too superficial. Everyone is a different personality, so stop comparing and embrace your pace of life and be grateful for what you have. Too much use of a smartphone can lead to various eyes problems and also it could distract you from something which is important indeed. Also, the use of smartphone and internet can make you lazy and obsessed as you will always be in one place looking at your smartphone screen. To use or to misuse, it’s up to your choice, and if you’re smart enough you will definitely choose the right path and take the full advantage of the technology. So, go ahead and seize the opportunities you have. Previous articleHow To Protect Your Smartphone?